Lavender, often used as an aromatic herb, adds an attractive touch to flower gardens. The bushy, shrub-like foliage is a muted blue-gray color, and each stem is tipped with small lavender flowers. It works well as an edging plant with taller grasses, flowers or bushes planted behind it. Lavender has a lifespan of three to five years. There are varieties of lavender well suited to both northern and southern gardens. Plant lavender in an area with full sun to partial shade. Prune plants or trees surrounding established lavender plants to allow access to more sunlight. Allow the top layer of soil to dry out before watering during the first year. Only water during hot, dry weather with little natural rainfall in subsequent years. Cut back lavender in the autumn of the second or third year. Prune each branch back to 10 inches. Remove the dead leaves and branches (thatch) in the center of the plant. Leave at least 6 inches around each lavender plant clear of weeds and other plants. Humidity trapped between plants can damage the lavender. 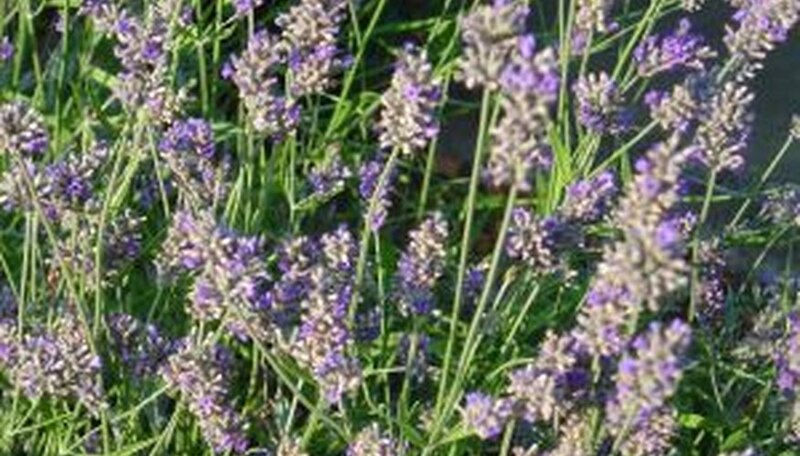 Mulch around lavender with sand or gravel to keep weeds down and maintain temperatures in the soil in the cold months. Cut off lavender sprigs and bring them inside for the aromatic scent. Dry cut sprigs on newspaper in a cool, dry place. Put dried sprigs in cheesecloth bags and tuck them in closets or drawers as a sachet. Never use organic mulch with lavender; it leads to root rot. Avoid using fertilizers, as this will keep flowers from blooming.